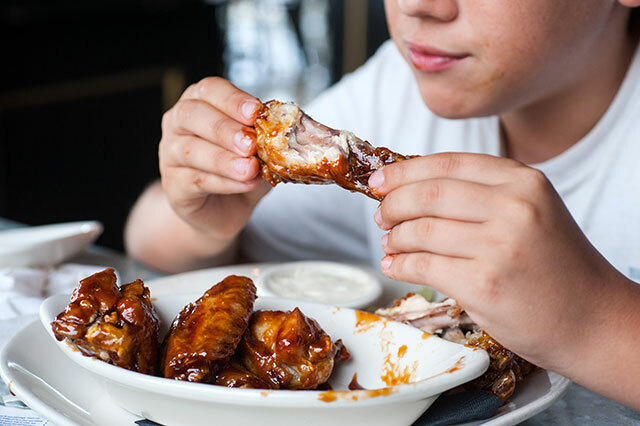 Few foods are as mighty, messy and marvelous as the chicken wing. You can have ‘em traditional-style with Buffalo sauce or dress them up in sweet Thai chili. They’re even good plain, or “naked,” as you’ll see them scandalously advertised on some menus. So we weren’t surprised to learn there’s a whole day devoted to the simple, incomparable goodness of chicken wings. Sunday, July 29 is National Chicken Wing Day, and we found the best spots for you to get your fix on the cheap. Done reading and ready to eat already? Here’s where to head for bargain wings. Buffalo Wild Wings – your go-to spot for a college-y feel with ample, sports-filled TV screens– is offering free snack wings with the purchase of any small, medium or large order of traditional or boneless wings. This offer will be valid for dine-in only at participating locations while supplies last, so be sure to check with your nearest location before you head out to get your wing on. This Sunday at East Coast Wings, you’ll only pay 50 cents per wing on traditional and boneless orders up to 25 wings. The offer is dine-in only. It’s not completely free, but Hooters will offer 10 free boneless wings with the purchase of any 10 wings. This Florida-based wing restaurant will give you five free Buffalo or original wings when you purchase an order of 10 Buffalo or original wings. If you’re not a fan of those flavors, WingHouse restaurants have 18 sauces to choose from, so you’re sure to find something to suit your tastes this Sunday. Participating Wingstop locations are offering five free wings with any online wing purchase. Just place your order between 11 a.m. and 5 p.m. and use the promo code 5FREEWINGS. If the deal is on at your nearest location, then get ready to choose from 11 different flavors, including Original Hot, Atomic, Mild, Cajun, Teriyaki, Hawaiian, Lemon Pepper, Garlic Parmesan, Louisiana Rub, Mango Habanero and Hickory Smoked BBQ. Oh boy, how will you choose? If you’re a fan of gas station wings, then we’ve got good news: 7-Eleven has dubbed this weekend National Wing Weekend and is offering 10 wings for $7.11 all weekend long. No matter where you go — or even if you just stay home with your very own grill — enjoy National Chicken Wing Day! Jamie Cattanach is a contributor to The Penny Hoarder and chicken wing enthusiast. Footy’s sauce is still the best, and no one beats her mom on the grill.